A local newspaper’s front page picture has sparked a nationwide debate on how Scotland is policed. 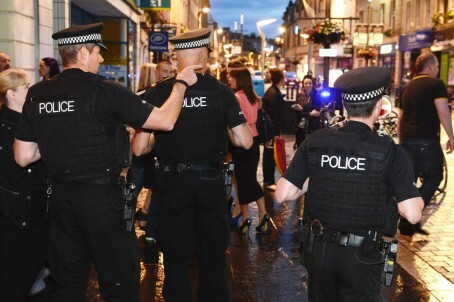 The Inverness Courier published an image in its 15 July edition showing three armed police officers walking up Inverness High Street. It sparked a huge public debate culminating in Scottish Justice Secretary Kenny MacAskill having to explain to parliament in Holyrood why police officers are now carrying handguns on patrols. The Courier has since launched a petition demanding a review of the Police Scotland policy in the Highlands. Under a new united countrywide force’s policy, brought in without public consultation, 16 officers in the Highlands are authorised to routinely carry sidearms where previously, the weapons were kept locked in dedicated armed response vehicles and only brought out when needed. Robert Taylor, editor of the 200-year-old twice-weekly publication, said: “The police have been telling us for years this is the safest place in Britain to live. “So what has changed? Why do we suddenly need armed police wandering down the streets of Inverness. Officers with guns in our shopping centres have made people uneasy. The splash picture in the Tuesday 15 July edition of the Courier has had the widest ranging repercussions for the police force, its chief constable Sir Stephen House and the SNP-led Scottish government in the last month. Politicians on the Highland Council took an unprecedented vote to call on Sir Stephen to review the policy. Justice minister Kenny MacAskill told the Scottish parliament that police in the country would not be “routinely armed” while claiming that three former forces had endorsed the national roll-out on carrying handguns in patrols. Mr MacAskill said Police Scotland has 275 officers carrying firearms – representing less than two per cent of Police Scotland’s personnel. Chief constable Sir Stephen House said the operational decision was “unlikely to change in the future” but a routine review of policy would be undertaken next month. Since the initial coverage of the issue, the Courier’s editor says he took the decision to syndicate the firearms picture to a national audience – proving a catalyst for the whole debate. “Sadly we couldn’t take it to that audience but now it has become a UK-wide debate on how Scotland is policed,” he added. “The Daily Mail called the issue a ‘betrayal of policing’,” said Robert. “We haven’t gone that far in condemning this, instead taking a line that our paper is a forum for views on both sides. “Some people are comfortable with the guns policy, the vast majority aren’t. Since the debate ignited we have turned over our readers’ letters and online forum to the coverage of this issue. “One thing is certain – there should have been a public debate before this was introduced. It’s all come about since Police Scotland was introduced, bringing the forces together. “Sir Stephen insists the policy has been introduced in response to intelligence, but as this material is classified he cannot tell us what form the new threat to our safety takes. “Certainly, on the ground in Inverness and the Highlands we see nothing to justify the introduction of gun-toting PCs. But one thing in the justice minister’s statement, with which Robert is not happy involves the suggestion that the old Northern Constabulary – one of the forces to make way for Police Scotland last year – was in favour of the guns policy. “We’ve checked back with the people formerly involved and they are saying Mr MacAskill has got that assumption wrong,” said Robert. Can’t see a police explanation why this trio were carrying guns in a town centre… A specific incident? General threat of gun user(s) appearing in streets? It used to be that anyone of good character could apply to the police for a licence to keep a pistol. That has now been abolished. So one wonders why the police feel the need to so brazenly carry arms. I don’t like it and I don’t think it is necessary. This is not America. The vast majority of people do not have firearms. The vast majority of criminals do not have firearms. Parading around with guns just makes it more likely that a scroat will steal a gun from a policeman. Armed police should be kept for exceptional circumstances and kept away from public sight until needed. They should not be parading around like they think they are Wyatt Earp in Tombstone. Childish and very, very dangerous. We see no reason why firearms should be carried in the streets of Inverness. Armed police should be only on needed if there is an incident requiring same.